First, the FARC and the ELN have dispersed their fronts on a wider territory, strenthening their presence in areas in which they enjoyed popular support. Both groups also activated their links with the popular movements in cities, as was demonstrated in 2011 by the huge rally in the oil-city of Barancabermeja and again in their support of the Marcha Patriotica in Bogota earlier this year. In addition, NACLA reports that the Armed Revolutionary Forces of Colombia have increased their attacks by 57 percent from one year ago. They are also attacking the state where it hurts most: its wallet. 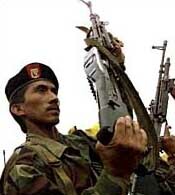 States NACLA, “it is estimated that the guerrillas’ attacks against pipelines and other related installations are causing a daily income loss of $1 million.” If the Colombian government does not find a way to counter the insurgency soon, the war may be over shortly. Street exit, the first stop in Brooklyn after leaving Manhattan. taken by the photojournalist and author Stephen Ferry. suffering of the people of Colombia and their heroic resistance. forces also engage in violence, but it does claim to be revolutionaries. a cause which is undermined by US policies.